Check out what I personally believe to be the Best Young Living Thieves Products to invest in for keeping your home clean and healthy this year. Not only will I go over why I think these are the best, but I will also share with you how I use them at home, at work, and while our family is on the road. If you are new to essential oils, you can find more information here about how to be a part of what I believe to be the best essential oil company and how I use them. About four years ago I started my essential oil journey with Young Living. I was really excited to bring something more natural into my home, while removing what I believe to be toxic chemicals from my home. 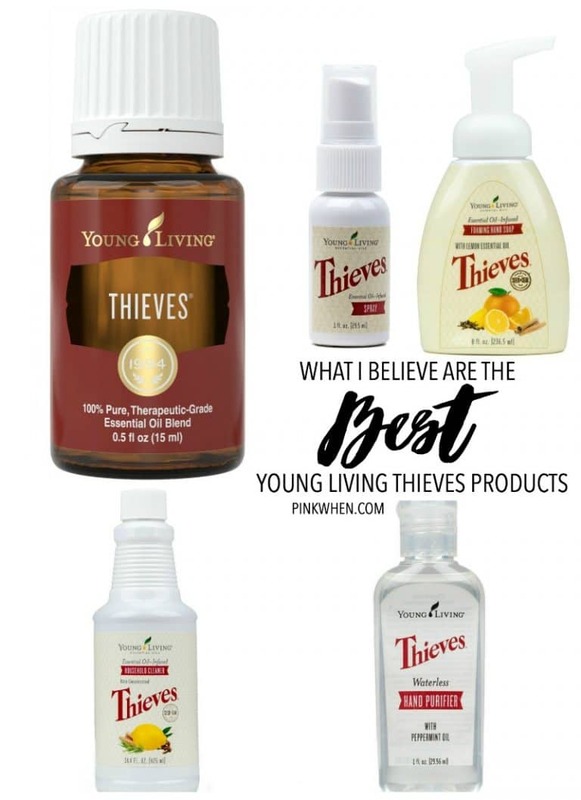 It didn’t take long for me to figure out my favorite products, and they almost all include Thieves. Want to know why I love Thieves essential oil as much as I do? Here is just one of my personal testimonials. As most of you know, I have a family of 6. When my daughter was 4, she received her 4 year old shots and also got a flu shot. Fast forward 2 months later and SHE came down with the flu. My husband and I freaked out because none of us had taken the flu shot that year except for her. To make matters worse, she had been sleeping in the bed with us since she started feeling sick. We were positively sure we would both come down with the flu, but I was on a mission to combat it! I diffused Thieves every single day, placed Thieves essential oil on our feet, used the hand sanitizer religiously, and cleaned most surfaces with the Thieves cleaner. No one else was stricken with the flu, and I 100% believe it was because of the Thieves. Now that you know my love for Young Living Thieves products, let me share my other favorites and why I like having them on hand. The Thieves cleaner has replaced most of my household cleaners. I love the fact that I am no longer cleaning with harsh chemicals but also getting better cleaning results. Not to mention, I am saving money by diluting the cleaner and making my own cleaners. Thieves soap is another of my favorites. I keep it at my office as well as at every single sink in our house. If you are washing your hands at our house, you will be using Thieves soap. Want to learn more about how to get started with Young Living Thieves products? You can check out how to get started with Young Living products on my page all about Young Living. You can start with a diffuser and a starter kit that has some other amazing products, including my favorite Thieves. Or, you can even start off with a Young Living Thieves starter kit. Trust me, you will become addicted!